The Communist Party of America organized in the United States in 1919 was a split-off from the Socialist Party after the Russian Revolution. It was affiliated with the Communist International, often called the Third International, which advocated for world communist revolutions to overthrow capitalism. The Communist Party of Wisconsin organized as a statewide branch of the national party in 1919, was headquartered in Milwaukee, and reached its peak in the 1930s and 1940s. The Communist Party of Wisconsin functioned as a political party and ran candidates for public office from 1924 to 1978 but never received over one percent of the vote. Especially during the 1930s, local party leaders frequently appeared on the ballots for both state and federal elections. Fred Bassett Blair, for instance, ran for Governor in 1930, 1932, 1940, 1942, and 1974, State Treasurer in 1978, U.S. Congress in 1934, and U.S. Senate in 1938. In addition to distributing the national party newspaper, The Daily Worker, the Communist Party of Wisconsin also published the Wisconsin Voice of Labor and the Wisconsin People’s Voice. It also circulated national and local party literature through its People’s Bookshop and Fred and Mary Blair’s store, Mary’s Bookshop. The party engaged in direct action and solidarity demonstrations. 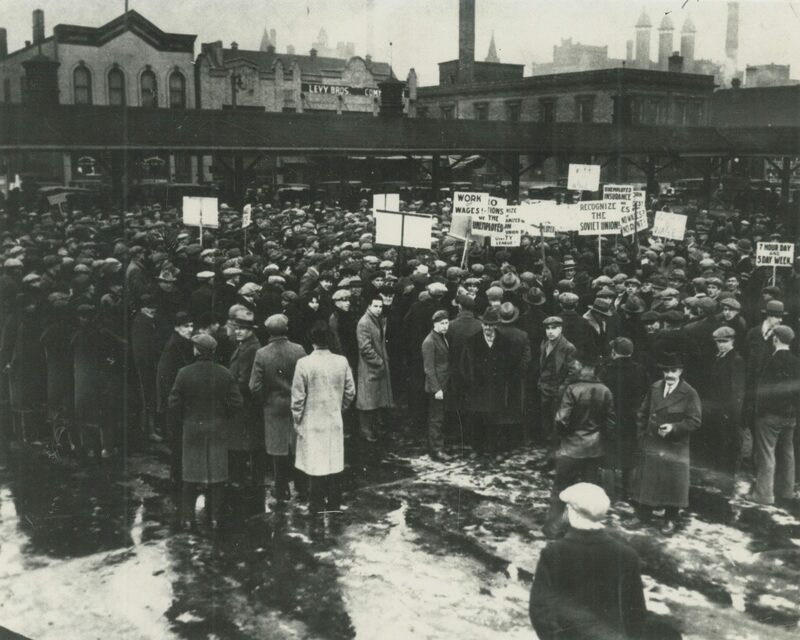 On March 6, 1930, for instance, thousands of communists and supporters staged an International Unemployed Workers Day demonstration in the Haymarket (6th and Vliet) to draw public attention to the growing ranks of unemployed workers during the Depression. The event ended violently as demonstrators clashed with police who moved in to disperse the crowd. The party was also very active in Milwaukee’s labor movement, particularly in the Congress of Industrial Organizations’ unionization drives of the 1930s and 1940s. Most notably, Milwaukee communists assisted workers with organizing the CIO union, UAW Local 248, at Allis-Chalmers in 1937. Throughout the 1930s and 1940s, the party also organized annual May Day celebrations at the Milwaukee Auditorium and other large halls. These events featured speeches on the exploitation of labor and the values of communism, locally, nationally, and internationally. There were a number of prominent communist figures in Milwaukee, especially during the party’s peak in the 1930s and 1940s. Fred Basset Blair served several terms as state chairman and remained a prominent local party leader from the early 1930s to the 1980s. Eugene Dennis served as state secretary from 1935-1937, moving on to become general secretary of the national Communist Party in 1945. Meta Berger, Milwaukee School Board member and widow of Milwaukee Socialist Congressman Victor Berger, also became active in party coalitions with other labor and political organizations and often hosted party meetings and social gatherings at her home. The emergence of the Cold War in 1946 made affiliation with the Communist Party akin to supporting a hostile foreign power. Labor leaders with Communist Party membership or sympathies were expelled from leadership positions “Communist dominated unions” were expelled from the CIO. The party survived the collapse of the Soviet Union and the world communist international in the 1990s. The national Communist Party convention was hosted in Milwaukee in 2001. ^ “Third International,” Encyclopedia Britannica, accessed July 24, 2016; “History,” Communist Party of Wisconsin, accessed July 24, 2016. See also Fraser M. Ottanelli, The Communist Party of the United States: From the Depression to World War II (New Brunswick, NJ: Rutgers University Press, 1991), 9-10; The Communist Party of the United States of America, Constitution of the Communist Party of the United States of America, amended 2001 ed. (New York, NY: Communist Party USA, 2001). ^ Wisconsin Blue Books Digital Collections, accessed July 24, 2016. ^ Thomas W. Gavett, Development of the Labor Movement in Milwaukee (Madison, WI: University of Wisconsin Press, 1965), 177; “4 Witnesses Openly Linked to Red Groups,” Milwaukee Sentinel, March 30, 1955, part 1, p. 2. ^ The exact size of the crowd is difficult to determine. The Daily Worker reported 40,000 people, the Journal reported 1,500, and the Sentinel 1,000. Harvey Klehr, The Heyday of American Communism: The Depression Decade (New York, NY: Basic Books, 1984), 34; “Officer Kicked in ‘Red’ Clash,” Milwaukee Journal, March 6, 1930, p. 1; “Officers and Speaker Hit in ‘Red’ Crowd,” Milwaukee Journal, March 6, 1930, final edition, p. 1; “Jail Asked for 20 of 51 Held in Riot, Trial Begins for First Five after Clash,” Milwaukee Journal, March 7, 1930, p. 1-2; “First 15 Are Tried after Riots, Defense to Be Delayed Until Later Hearing,” Milwaukee Journal, March 7, 1930, final edition, p. 1; “49 Jailed, 9 Hurt as Cops Battle 1,000 Radicals Here, Machine Gun Squads Called Out after Red Agitator Begins Riot,” Milwaukee Sentinel, March 7, 1930, p. 1. ^ Stephen Meyer, “Stalin Over Wisconsin”: The Making and Unmaking of Militant Unionism, 1900-1950 (New Brunswick, NJ: Rutgers University Press, 1992). ^ Milwaukee Journal, May 2, 1934, p. 14; “4 Witnesses Openly Linked to Red Groups,” Milwaukee Sentinel, March 30, 1955, part 1, p. 2; “Reds Rally Here, Hear: ‘Socialism as American as Wisconsin Cheese,’” Milwaukee Sentinel, May 2, 1949, part 1, p. 2. ^ “Officers and Speaker Hit in ‘Red’ Crowd,” Milwaukee Journal, March 6, 1930, final edition, p. 1; Stephen Meyer, “Stalin Over Wisconsin,” 10; “Communist out for U.S. Senate,” Milwaukee Sentinel, August 4, 1938, p. 20; “Group Hears Censor Case,” Milwaukee Journal, November 2, 1939, p. 24; Milwaukee Sentinel, October 8, 1946, p. 1; “Costello Quiz Is Ruled Out,” Milwaukee Journal, June 27, 1947, p. 8; “Superstars and Cats Predict Effects of 4 More Years,” Milwaukee Journal, November 8, 1984, Metro News, p. 1. ^ Meyer, “Stalin Over Wisconsin,” 10; Peggy Dennis, The Autobiography of an American Communist: A Personal View of a Political Life, 1925-1975 (Berkeley, CA: Creative Arts Book Co., 1977). ^ Dennis, Autobiography of an American Communist, 107-109; “Milwaukeean Says Reds Rule Youth Congress,” Milwaukee Sentinel, November 30, 1939, p. 26; “Berger Break Told by Party,” Milwaukee Journal, May 4, 1940, p. 14. ^ Meyer, “Stalin Over Wisconsin”; Gavett, Development of the Labor Movement in Milwaukee, 184-97. ^ The mayor’s routine welcome to the conventioneers caused a bit of a stir. See B. Drummond Ayres Jr., “Political Briefing; Red-Carpet Welcome Has Mayor on the Spot,” New York Times, July 22, 2001, accessed July 24, 2016.